This 2 hour Intro to DSLR photography workshop in Ballarat is a practical based course designed to help get you off auto mode and getting more out of your digital SLR camera. The aim is to help you understand some of the basic technical aspects of your camera like ISO, aperture and shutterspeed and get you thinking creatively to take your photography to the next level. 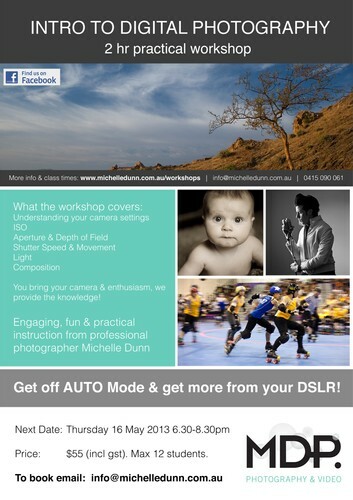 It's engaging and fun, with instruction from local professional photographer Michelle Dunn. Contact Michelle at info@michelledunn.com.au for more information or to book.